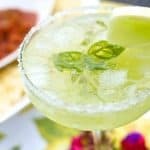 Get refreshed with this summer time cocktail! Add ice cubes and remaining ingredients. Cover shaker and shake vigorously for 10-15 seconds. Strain into a glass over crushed ice. Garnish with melon and a spanked basil leaf. Some of the honeydew pulp make slip into the glass during straining which is completely ok!